Where are you planning to go in Scotland. A superb post. you have obviously put a lot of work into fitting the canoe and into the post. With your permission I would like to copy the post over to the main site. Thats a great post. As you say - a picture says a thousand words. ......Where are you planning to go in Scotland. I'm also planning on booking myself and my wife onto the "Learn to White Water Open Canoe" course at Glenmore Lodge. For which I did a post a while back. So hopefully another week North of the boarder during August. Yes. I have no problems with you copying my post. Hopefully the links will save others from the hours of searching that I did on Google. That's some very impressive outfitting there - the netting looks really very good indeed. It's a great way of lashing stuff in, I occasionally use a pre-made bungie netting arrangement (really designed to hold odd shaped stuff onto the back of motorbikes), just kinda hooked into whatever it hooks into, but the level of thought that's clearly gone into this does you proud. While I have to admit I don't do a lot of white water, as most of our trips are wilderness trips (it just isn't worth dumping when you are a week away from civilization) - I am somewhat intrigued with this idea of air bags. In 40 plus years of canoeing, in Minnesota and Canada - I've never seen a canoe with air bags! I've dumped plenty of canoes over the years, and I've never had an issue with the canoe sinking. I've don't believe I've even lost that much gear - a couple of fishing rods and some fishing tackle is all that comes to mind. On long hauls with big waves, we sometimes lash down the packs. The packs help with boyancy. With all those airbags in the canoe - where do you put your packs? I wonder if this is indicative of the UK perspective on things? Like for example the whole country grinds to a halt when we get a centimetre of snow. However in Canada and the north, they just cope and get on with things. Maybe we just think we need airbags? Granted - a swamped boat loses all stability and needs emptying - but do they sink? I'm not really going to test if my craft will float or sink and risk loosing all that kit. Like they say in the boy scouts. "Be prepared"
...and inexperienced as I am, I did manage to turn it over on the Severn last year. Thing is the airbags will not stop your stuff falling out and floating away if you capsize. They will make it easier to right, get in and bail. They do not help with the handling of the canoe and I am occasionally concerned that people become over confident because they have airbags and think they will save the day. It is a bit like a study that showed that motorcycle drivers were far more careful when they had no helmet. The helmet gave a false sense of security that get them in more trouble by being reckless. I am not saying they are bad or anything but I do wonder if they are overrated for the type of canoeing I do. For whitewater etc there is no argument and you can never have too much safety gear but I would debate how high on my list of priorities they should be for the trips I make. I notice in Becky Mason's DVD she demonstrated righting the canoe and paddling it back swamped. I now feel rather ashamed, as my boat looks like the naval leg of Napoleon's retreat from Moscow on most trips. When it's choppy, I use Motorcycle bungee nets, too, from a previous life. Excellent - Im seriously impressed by your attention to detail . Thanks for the links too. The vinyl is very thick and I was concerned about stiching it but my mothers "Brother" sewing machine coped reasonably well ; though I did break about 5 - "16" gauge needles. I use leather punch needels for sewing thick stuff - usually don't break any. I'm not, in the least, downplaying your work. It looks very professional. If I felt the need, and you lived near by, I would be going to you for advice. I'm sure the airbags would help tremendously with keeping a dumped canoe higher in the water. I've never had a dumped canoe sink, though, and strapping in the packs assists with floatation - plus it keeps the packs from floating off. I understand your concern as some of my canoeing is done on Lake Superior. what happened to your great pictures newdaze i was looking for some ideas for fitting my own allagash. He must have moved them, however, as luck would have it I copied his post onto the main site last week. I'll go back and edit Newdaze's post to add back the pictures from the ones on SotP. I don't like to be a wet blanket, but securing airbags to the gunwale is not a good thing. There have been incidents where the gunwales have been ripped out of a swamped boat by the airbags. This is why stitching the canoe is to be recommended. Great thread. I'm not very handy but even I could have a go at the netting. I found this website a while ago and I thought I would share it with you. There is a lot of the stuff you need to complete a project like this. Thanks again for the great pics and info. ive just bought a r.lite novacraft prospector and am starting to outfit it, i asked the shop about which bit i should lash buoyancy blcks to and was told to bolt stuff to the gunwales as newdaze has on his allagash. Maybe its different on r lite coz its thinner? i am really surprised the gunwales could be ripped out - thats some quite serious' ooomph' though that being a possibility must depend to a large degree on the material the hull is made of, the material and design of the gunwales, and the way they are attatched. Your shop may rivet things to the gunwales just as its standard way of doing things. The strongest way is definitely to lace through the hull - rivets are not a great join where big forces are involved. though at this point the argument is as they say academic because i still haven't managed to track down anything to make my buoyancy blocks out of- i have the outer fabric, various d rings, webbing and bungee cord etc but having called around every local swimming pool i can't find a single spare swimming float! I suspect for a manufacturer the easiest thing is to say rivet to the gunwales as they probably don't want you "damaging" the hull. Are you planning on doing any whitewater soon? If not, why don't you leave the outfitting for now until you've had a chance to go to a few meets and see other people's boats and from there make your own decisions? That would maybe save you rushing into anything. Maybe its different on r lite coz its thinner? If the idea is to fix to the gunwales to avoid loading the "thin" r lite hull you have to remember that the gunwales are fixed to the same r light - just nearer the edge and are therefore more likely to pull off the hull. Having said that all my fixings are to the gunwales. It is really quite easy to damage your gunwhales as my husband found out recently. On a fairly low Derwent through Matlock he tried to match the manouvres of the girls and ended up pinning his boat on Killer Rock he now needs two new gunwhales and would also be having to refix his airbags at some expense if he had rivetted and lashed to them. So I'd go for drilling the hull. Neat outfitting and thanks for the links too. Newdaze good job and photos are of great benifit to certain idiots who find written instructions hard to follow, ie More photos. Your photos gave me the confidence to recklessly take an electric drill and rivet gun with afore mentioned rivets to my canoe. My buoyancy bags now stay in place; all I have to do now is get the damned thing back in the water to try them out. One bonus is that due to the fact that they are now secure and can be fully inflated is that finned items throwing themselves into the canoe can stay. With many manufacturers it is a great way to void your warranty. With others the thought of puncturing the hull on purpose is little more than an insult. Lacing and netting is great stuff to get a wrist or an ankle through when the canoe rolls over a dozen times in a rock garden. Best to stay well up river of a British canoe. I also made an additional seat for my 2 daughters to sit side by side on. Being a bit of a perfectionist ; I wanted this to match the style of the exisiting seats. A friend owns a small timber business and he gave me a couple of lengths of white ash which were staind and varnished to match the existing seats. I had trouble locating a supplier for the webbing, which is the same herringbone weave as a car seat belt but only 40mm wide. Can I ask for some more details as to how you made the additional seat please? I have an idea in my head how to do it - two long bits, two short bits, drill holes where they'd join and glue in ~10mm doweling, then weave the webbing over - but I'm sure there must be more to it than this. How did you fix it in? Did you buy a fitting kit, or make that too? Would doweling be okay, or should it be threaded bar? Did you round off the edges of the wood? What tools did you need? Sorry for so many questions! I didn't weave the webbing in one length. I cut sections and they are stappled where they wrap around the underside. They are stappled along the inner edge of the "apperture". In doing this I copied how the existing seats were constructed. good post ive worked up the courage to fit my boat. Not sure if this is of any help, but recently we were making some Polo goals for the club and needed some netting. 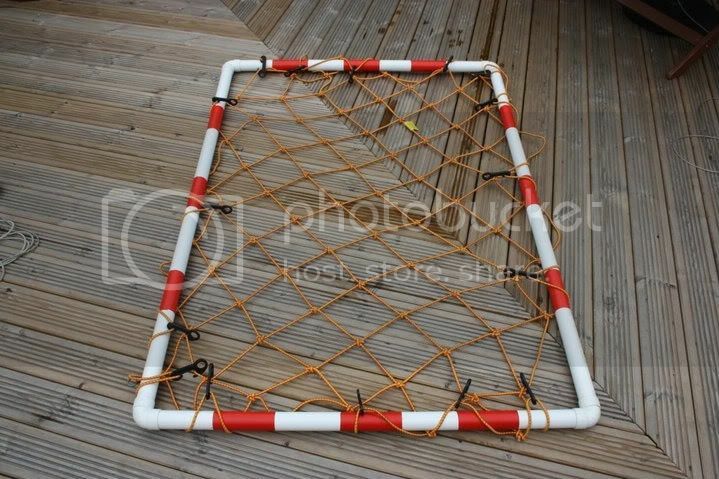 After much looing around I found these cargo nets in Screwfix - they are elasticated and come with plastic hooks around the edge - these were later removed and replaced with cable ties for a neater look. The size is 52" x 70" and cost £10-99. If I remember right; nets were originally designed to entangle and drown things?